Star Wars Inspired Nails that are from a Galaxy Far Far Away! Star Wars is iconic for so many reasons. Not only did it give kids and adults a love for outer space all over again, but taught us values with the Force and Republic as a guide of what to do and not to do. While the 1970’s movies with Carrie Fischer as Princess Leia will always be our favorite we can’t help love what Disney has done with the new series. This has inspired nail artists to create new looks and new nail art that are, well, out of this galaxy! So without further ado let’s check out the best Star Wars inspired nails that you never knew you were missing out on. I can’t start this list out any other way. Princess Leia wasn’t just a childhood role model for all girls out there to be fantastic and fiery, but she was also gorgeous. Her iconic hairstyle with buns on each side made all of us want to mimic it. She is iconic in fashion, in character and so was her actress the late Carrie Fisher. So these nails are minimalist style, but we know you will love them! I know it. Here is the tutorial for Leia inspired nails. Princess Leia, of course, can’t be put on this list without Han Solo! They are an item after all and the pair cannot be broken up in life or death. So far be it for me to break them up in the list. Here are some super cool minimalist Han Solo nail designs. This was recently inspired by the new Disney movie Han Solo: A Star Wars Story which featured Han’s story. It went way back to when he was a teenager trying to survive and shows how he became the scoundrel that Princess Leia would fall in love with. It was a fantastic movie, but these nails are even better. Check out the tutorial here. Star Wars Rogue One was a prequel to A New Hope, but it also gave new hope to nail artists everywhere. They began to figure out Rogue One inspired nails as soon as the movie hit theatres. And why shouldn’t they have? In true kickass women fashion Jyn is an inspirational female character who shows how strong women can be. She at first is against being part of the rebels and their cause, but soon realizes it’s where she was always meant to be. She makes the ultimate sacrifice for the rebellion and the galaxy. So these nails are rebellion inspired nails that Jyn would have loved. Here is the tutorial. May the Force be freehanded in this amazing Star Wars inspired nail art. These are freehanded nails that are all about the lightsabers. Every nail is a different lightsaber or saber inspired. This is one of those nail arts where you don’t have to pick a side. You can simply have cool nails that both the light and dark side of the Force would approve. Here is the amazing tutorial. May the Force be with you! The Force Awakens was Disney’s first movie in the Star Wars saga that brought back the old characters we loved and introduced a multitude of new characters for us to enjoy. A mix of new and old made the movie a blockbuster success. 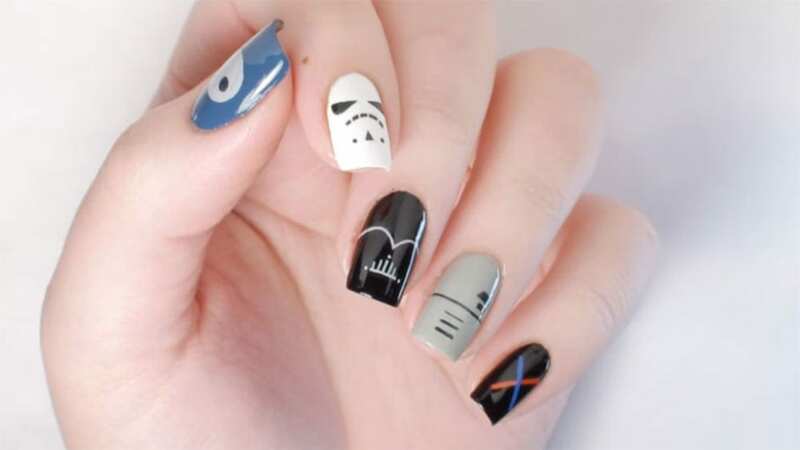 These nails will also be a Star Wars success for you as they mix new and old inspirations to create nails with different sabers, characters and plenty of minimalist style art that you will enjoy and be proud to show off to your rebel base. Minimalism is really in this year and you can see why when you look at these Force Awakens inspired nails. Looking for a bit more of the dark side of the nail art. No worries! Here is a very popular minimalist styled dark side nail art inspired by Star Wars characters like the stormtroopers, Darth Vader, and much more. These geeky chic nails are sure to please in any galaxy or setting! Get the look here. Are you a fan of the original Star Wars films? Do you remember in a New Hope when there were two moons on Tattooine? That beautiful sunset over the desert landscape is hard to forget because it looked beautiful, but out of place to our Earthling selves. Simply because there were literally two moons. This has been and will always be one of the most iconic Star Wars scenes because it makes you really feel like you could live on another planet and watch a sunset like that. To recreate this iconic scene on your nails, check out this awesome tutorial here. Do you want a mix of the old Star Wars with the New? Do you like droids? Then perhaps these droid inspired nails are for you. These nails feature the amazing R2D2, from all the Star Wars movies including the original 1970’s films, and R2-KT from Rogue One. If you are anything like me not only did you grow up adoring R2D2, but when you saw Rogue One R2-KT became your favorite droid out of the whole series! Why not put the two amazing droids in one great nail art collection? That’s exactly what ohmygoshpolish did! Here is her amazing tutorial. Whichever nails you decide to draw on and wherever you may find yourself may the Force be with you! Oh, and remember, there is no try when it comes to nail art there is only do or do not! I say choose the do!